So, bright colors and relatively exaggerated expressions are often common in these works. 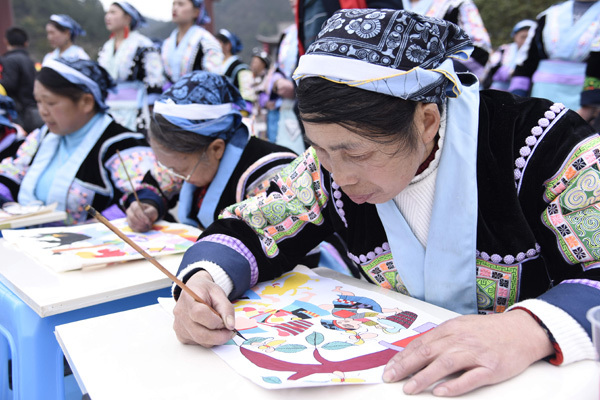 So far, more than 300 counties across the country have been regularly holding farmer painting events, and more than 130 villages often present works by their residents at national art exhibitions, according to a recent farmer painting seminar in Anhui province's Huoshan county. Approximately 30 areas have seen farmer painting grow over the years, including Jilin province's Dongfeng county, Shaanxi province's Huyi district, Shanghai's Jinshan district and Guangdong province's Longmen county. Also, as urbanization speeds up in China, the rural living environment and means of production are changing. So, farmers are moving from unassuming houses to modern buildings and mechanical tools are replacing hoes and sickles, presenting unique challenges to exponents of farmer painting. "Chinese farmer fine art and calligraphy need to be carried on, but innovation is also needed," says Bi Mingxin, head of the China Farmer Painting Seminar. So, Bi wants to see innovation in painting techniques and materials, as well as derivative products. 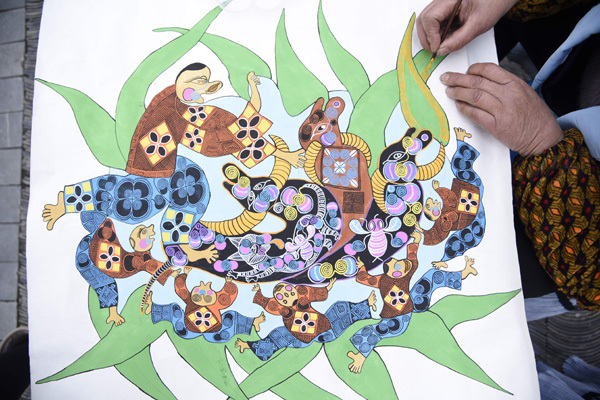 Jiang Deye from Zhejiang province's Zhoushan uses sea sand and acrylic paint to create a strong visual impact and a sense of color in his works that showcase local fishing and rural scenes. 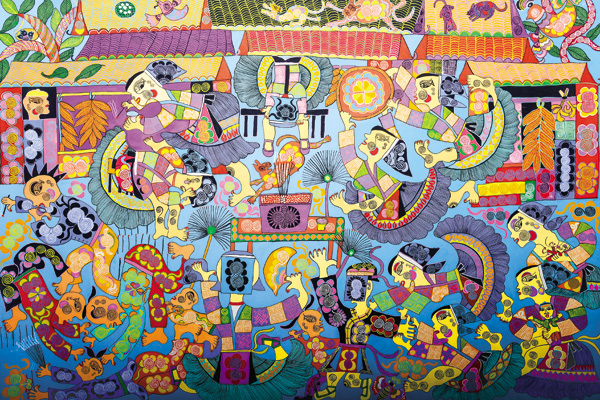 Separately, Jiang's works have made their way to major exhibitions both at home and abroad, including France, South Korea and Japan, in recent years. And the paintings have earned him more than 300,000 yuan (,663) a year. Meanwhile, Jiang has also designed an umbrella, a mobile phone case and a cushion containing farmer painting elements, all of which are popular. And Xuyuantang, a porcelain company in Fujian province, has developed a technique that applies calligraphy and painting to porcelain plates. This technique can serve as an alternative medium for farmer paintings and help to develop more derivatives with artistic value, says Chen Fubo, the company's president.